In these roles he would have been well known to all citizens of Lowndes, including those pioneers who settled at the site of Ray City, GA. He certainly would have known Levi J. Knight and his father, William Anderson Knight, who were also engaged in civic and political matters, although in politics Swain was a Democrat, whereas the Knights were staunch Whigs. Morgan Swain served as 1st Lieutenant of Militia in the 763rd District in Thomas County while Levi J. Knight was a Militia Captain in Lowndes County. While Swain was a Justice of the Peace in Troupville, Knight was the Justice of the Peace in his home district. An interesting series of legal advertisements in the pages of The Milledgeville Federal Union covered the affairs of one Uriah Kemp, of Troupville,GA. On January 6, 1839 Kemp obtained a judgement to seize a horse owned by Jacob Croft. 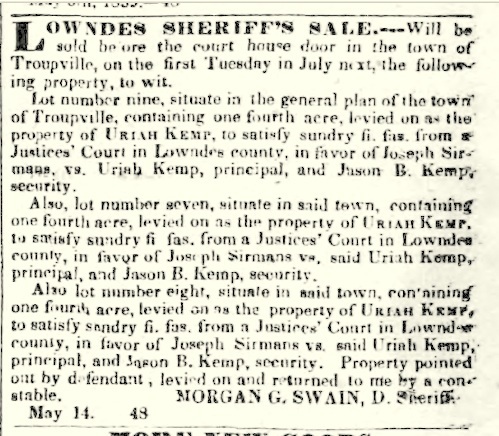 In May, several lots owned by Uriah Kemp in the town of Troupville were auctioned off by the Lowndes county Sheriff to satisfy a debt owed to Joseph Sirmans. Deputy Sheriff Morgan G. Swain advertised for the Lowndes County Sheriff’s Sale, May 21. 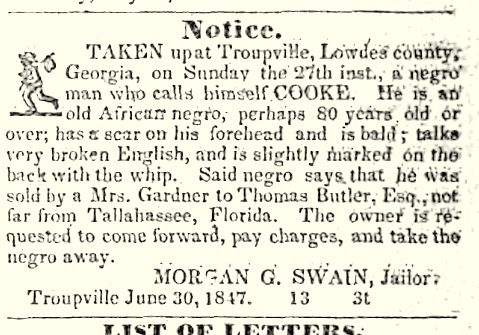 1839 Advertised in the Milledgeville Federal Union. 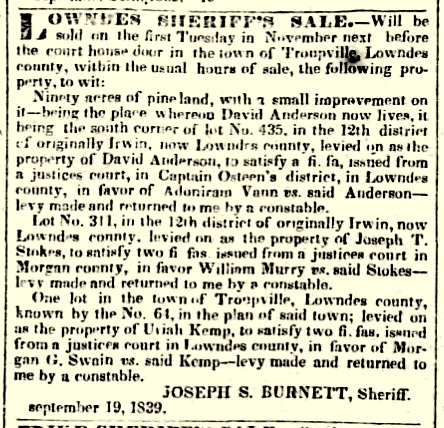 In the fall of 1839 Kemp was forced to sell lot 61 in Troupville, GA and Lot No. 238 in the 13th district in Thomas County to settle debts owed to Morgan G. Swain, himself. November 5, 1839 Morgan G. Swain collects on a debt in Thomas county. Sheriff’s Sale ad appeared in the Milledgeville Southern Recorder. A little more than a year later, Morgan G. Swain and Uriah Kemp were co-defendants in a lien action brought against them by Ryall B. Thomas. 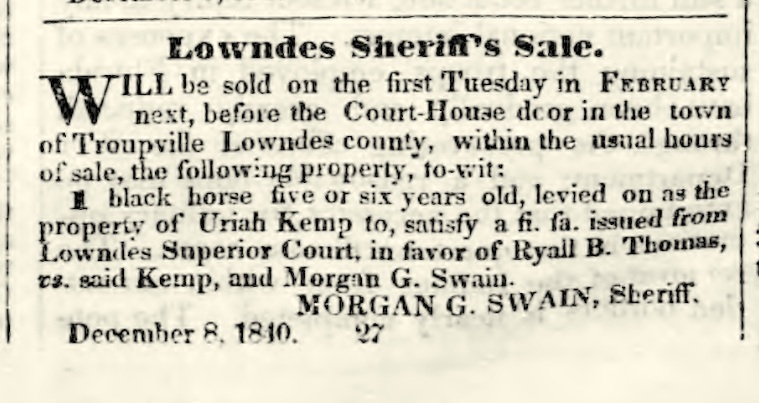 As reflected in the legal advertisements in the Milledgeville Federal Union, Morgan G. Swain entered duty as Sheriff of Lowndes County, GA. in 1840. One interesting case concerned a levy on 100 bushels of corn made by William C. Newbern against John A. Priester. Milledgeville Federal Union. 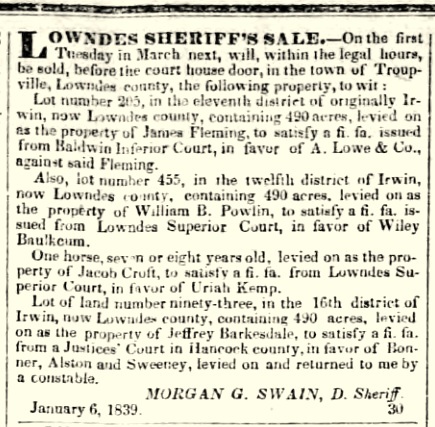 As Sheriff of Lowndes County, Morgan Swain also was responsible for the arrest of escaped slaves. Again, legal advertisements were placed by the sheriff in The Milledgeville Federal Union. 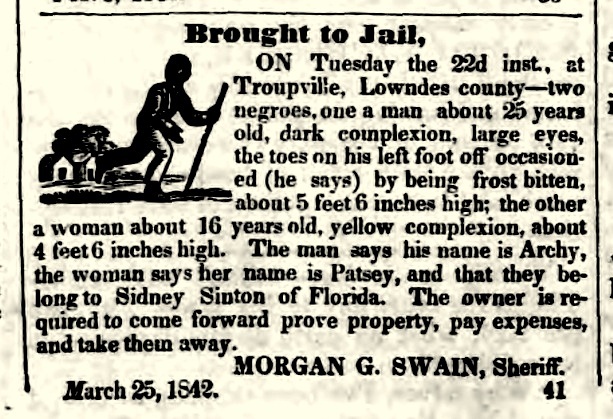 A clipping of the August 11, 1847 edition of The Albany Patriot lists Morgan G. Swain as Jailor of Lowndes County, responsible for the incarceration of captured runaway slaves.